Done with the sun? No plan for a tan? No worries. Nobody said you couldn’t have a great day out when it’s scorching hot outside. 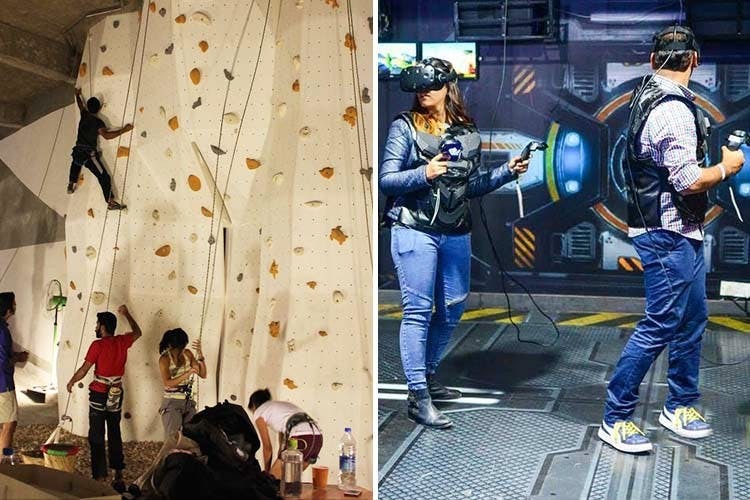 Check out these fun, indoor activities you can do around the city without hitting your boiling point. Skyjumper Indoor Trampoline Park is spread across 13,000 sq. ft. (that’s massive) and has 100 wall-to-wall interconnected trampolines you can jump on. They also have a big pool of foam cubes you can leap, hop, or go flying into. You can enjoy a jumpy game of volleyball on the trampolines, or go for the one-on-one variant. There’s dodgeball, too, so you can take out all your frustration with some well-aimed headshots. DLF Phase 2's Oh My Game will have you playing footy with a zorb bubble as your costume. The game is played with only five players per team, and each half is only five minutes long. But the really tough part is being inside a zorb bubble and scoring a goal against your opponent – while making sure you knock them down too! That is the only way to win it. Up for the challenge? In case football is not really your jam, opt for laser tag and the VR games here. With multi-level sky karting tracks (only at the Gurgaon, Sector 29 branch), VR gaming (virtual roller coaster anyone? ), cricket simulators, bowling alleys, laser tag and more – Smaaash makes for the perfect, indoor activity hub. They’ve even got a multi-cuisine restaurant and a bar to unwind at afterwards. Best way to beat the heat? Entering an ice rink, of course. There are a couple of them around the city—iSkate in Gurgaon and Snow World in Noida. The former has a huge rink which can easily accommodate about 150 people, with enough instructors to guide you and a cafe to hang at. Snow World (previously known as Ski India), the latter, is Delhi NCR’s first ski resort, complete with skiing and slope tobogganing to bobsledding, snow-sledging, ice-skating and a snow carousel. Who said you can’t jump and climb around like a monkey indoors? Delhi Rock in GK is just the place to do that. They’ve got high walls, an arch (which is a challenge to climb on top of), rope-climbing and more to put your arms and shoulders through a strength test. With beginner’s sessions and classes with no batches, The Clay Company has pottery classes and courses that you can take up to either explore your interest in clay, or to just try out a new kind of weekend activity. The basic foundation course is for 2.5 hours,and will teach you all the basics. For more options, check out our list of pottery classes in town. There’s nothing like watching the ten pins go down all at once—bowling is almost cathartic. Delhi’s got a bunch of bowling alleys spread across town—be it a booze-bowling fest at Yes Minister, Glued Reloaded or Amoeba you can always say your goodbyes to the heat and head in for a game or two. Mystery/escape rooms are a great way to put your wits and problem solving skills to the test in a fun way—the only sweating you do here is the mental kind. The city’s got a lot of these puzzle hubs with different scenarios. Be it a defuse-the-bomb situation, or a murder mystery theme – escape rooms always make for a fun time with the gang. It's always a good time to brush up your artistic skills because you never have any idea when or how you might end up needing them and also, creating art can be a lot of fun. Thankfully, Delhi has a bunch of ventures like HobbMob Studio, Delhi Drawing Room and Culture Chauraha that host the most fun workshops and classes. These places offer everything from DIY fairy light-making and block-printing workshops to paint parties, and calligraphy and macrame classes. Tastesutra is a venture that helps people master cusines and dishes in the most fun and interactive way. The art of plating, chopping, cleaning and cooking everything from starters to desserts (with 7-8 types of dishes) are some of the many things attendees are taught in these classes. The classes are organised in groups of two and can go up to a maximum of 25 people in one group.